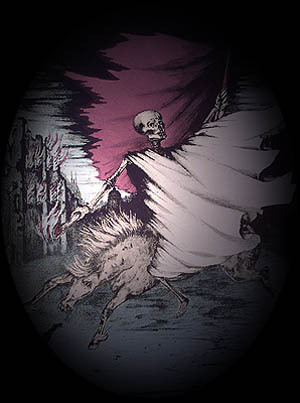 A grim saraband of skeletons, coming to take you away. Momento mori: remember that you must die. The middle ages preached this lesson with particular intensity. Graphic artists-- Hans Holbein most influentially-- responded to the urgency, to the undeniable power of this topos with scenes in which a dancing, skeletal Reaper came for the archbishop and the servant, the judge and the doctor, the mother and the child. In the nineteenth century the motif is re-energized by revolution and social upheaval, and heralds the arrival of a social fantastic with Alfred Rethels great series, Auch ein Todtentanz. Cornells extensive collection includes rare works that have never been reproduced in the literature devoted to the subject. Freunds Heins Erscheinungen (in Holbeins Manier) and Merkel and Flegels Bilder des Todes join Thomas Rowlandsonís satirical classic English Dance of Death, for especially remarkable depictions of suicide. The collection also contains early, important studies, like Peignots Recherches sur les danses des morts (1826), which links the theme to the iconography of playing cards; Achille Jubinals Explication de la danse des morts de la Chaise-Dieu (1841) a hand-colored example of early art-historical interest in ecclesiastical danse macabre frescoes; and E.-H. Langloiss definitive Essai sur la danse des morts (1852). Clark, James M. The Dance of Death in the Middle Ages and Renaissance. Glasgow: Jackson, 1950. Collins, Marcia.The Dance of Death in Book Illustration. Exhibition Catalogue, Ellis Library, University of Missouri-Columbia, 1978. Sara Webster Goodwin. Kitsch and Culture: The Dance of Death in Literature and Art. NY: Garland, 1986. The Dance of Death from the XIIth to the XXth Century: The notable collection of Miss Susan Minns of Boston Mass. Auction Catalogue, published by the American Art Association, NY, 1922. Villiers de lIsle-Adam, Contes cruels. Theophile Gautier, Contes fantastiques. Joan Kessler, ed. Demons of the Night.